In the last week of June, I received an alarming call from Rangoon. 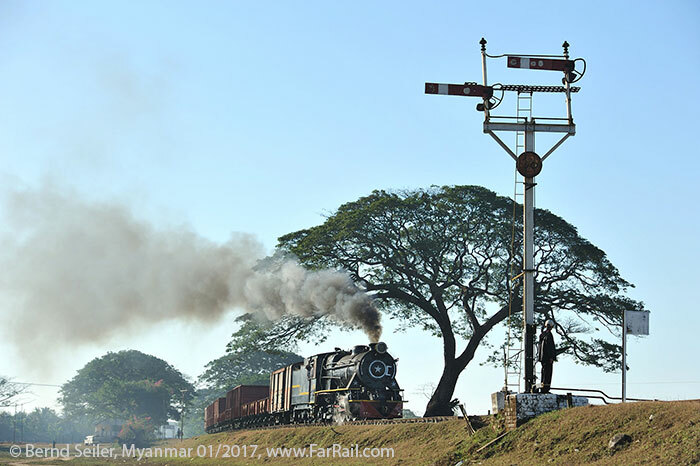 They’re now planning to cut down the semaphores and gantries of Bago’s traditional British signalling a year ahead of schedule, in June 2018. Now, after years of negotiations to get the authentic steam trains we need, they have decided to remove all of the infrastructure which was typical for the age of steam! As the tour in January 2018 is already sold out, we’re glad to add an additional one in October/November 2017 to see all the glories of British railway engineering before it‘s too late. At the end of October, the last clouds of the monsoon should have disappeared and the air is clear with good visibility. The green is lush and the ponds and streams should be full of water which will allow more reflection shots than later in the year. 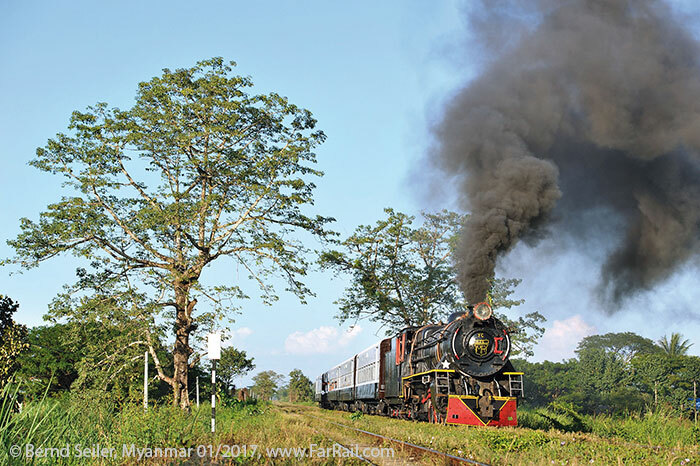 We‘ll see one of Asia’s last working steam hauled mixed trains again, the 85 up/86 down to Mottama, a regular train which it is feared will soon disappear from Myanma Railway’s timetable. In the morning we’ll visit the depot at Mottama, where our steam loco is serviced. Around 9 am it will be transferred behind diesel to Thaton. From here our steam loco will take over the 86 down mixed. 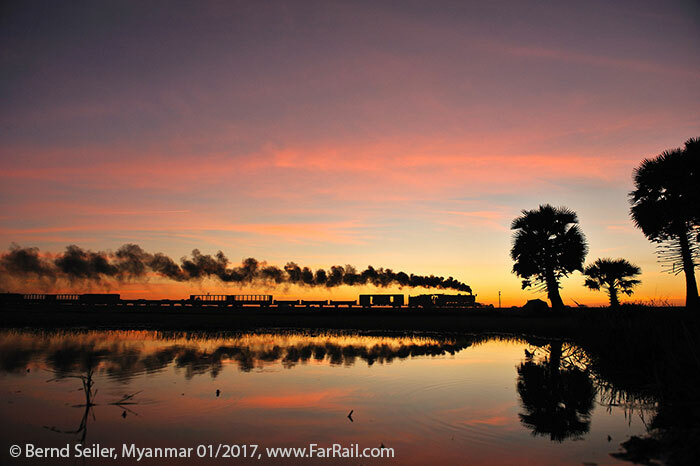 The train will never be able to reach Bago in daylight, we’ll chase it up to Mokpalin which will probably be reached by sunset. From Mokpalin the train continues by diesel. We’ll continue by charter bus to our hotel in Bago. In the morning we’ll head for the airport at Yangon. If you book your own flight it must leave after 13 hours. 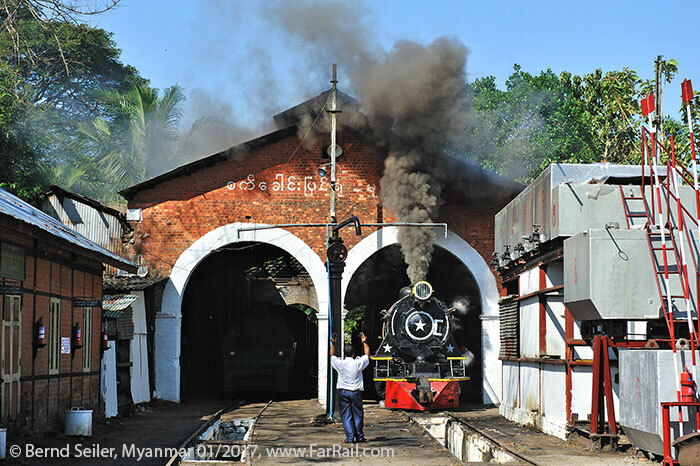 Bago (the town was previously known as Pegu) was one of the last steam sheds of Burma. They served two lines, the first of which headed to Mottama, southeast of Bago. Initially it is flat but not without photographic potential. Beyond the bridge over the Sittaung River (photography prohibited, but we’ll see …), hills appear. At Mokpalin, there is a small, barely used shed with a turntable, overhauled for our group. Locos can take water here and minor repairs are still possible. Further down, the railway comes closer and closer to the mountains and between Thaton and Mottama the line becomes very scenic. There are no steep gradients, but the scenery is outstanding, especially in the afternoon with the light from the "right" side. Mottama itself used to have a small loco shed. After the opening of the bridge to Moulmine this shed was almost shut down but still hosts a crane and an armoured railcar. They’ve rebuilt from scratch for us the long time out of use triangle to enable us to turn our locomotive there. For our trains, we have requested and paid for the Myanma Railways to overhaul a number of wagons and re-paint the passengers coaches we want to use. 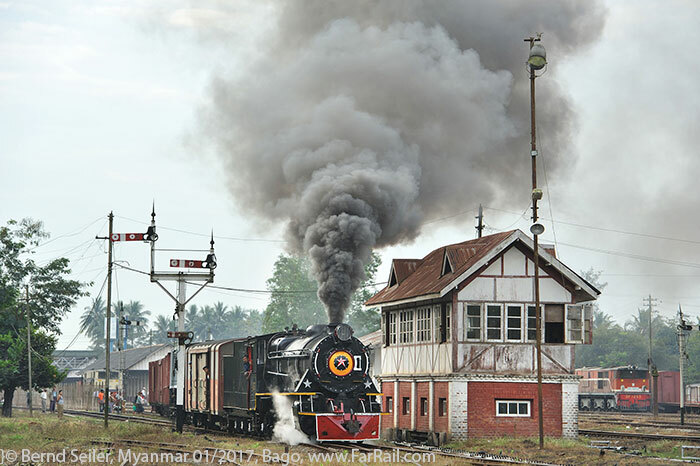 The second line Bago based locomotives covered, was the main line, Yangon  Bago  Pyuntaza, and beyond. 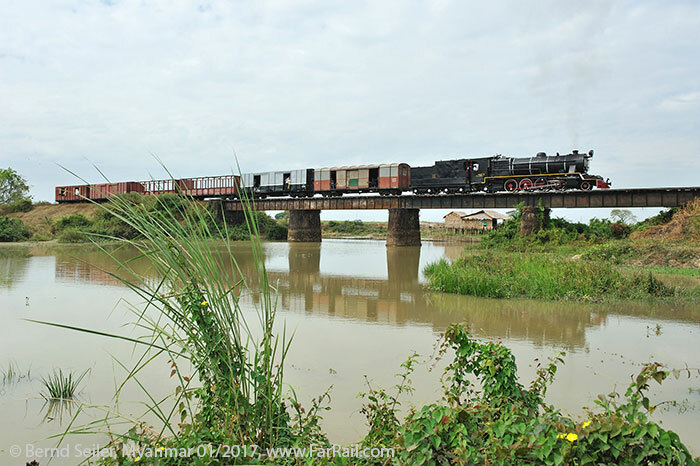 On some trains, the locomotives from Bago could appear as far north as Taungoo. The southern part of the main line has little photographic potential. However, there is one spot not to be missed, with a huge pagoda in the backdrop. In addition, the signalling system is still in the traditional British style, after the first attempts to modernise it died in the floods of some of the last monsoons. There is a plan to equip the line with colour light signals, of course, an this should from June 2018. So the fantastic gantries from British times will still be there and form a superb backdrop for our steam trains over the main line. The rarely used locomotives have a reduced boiler pressure and so can’t handle the same weight as before. In addition, it is not certain that the locos can manage all the way without any trouble. Crews are not skilled anymore and the overhaul was a very cheap one. But the intention was to have them ready for light passenger trains only, with around three to a maximum of five coaches. So please expect delays not only from the operational perspective (they are very common in Burma), but also from a technical point of view. It cannot be guaranteed that anything will work exactly as planned and paid for. 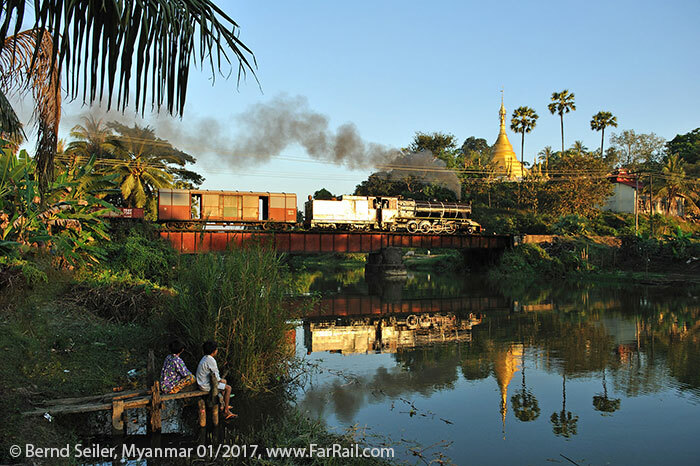 To reduce the risk we’ve ordered two different locomotives at Bago. The second loco can help out if the first fails. But there is still no guarantee. We’re there a decade after the last fire was dropped! However, on our last tour in January 2017 everything worked out fine. All the three locos performed perfectly. We have three serviceable locomotives, which we hope to use. There are two 2-8-2 Mikados of class YD and one 4-6-2 Pacific of class YC. We’re still negotiating about a fourth locomotive, another 4-6-2 Pacific. Whether or not these negotiations will be successful  and when  is unpredictable. The train 85 up/86 down will be followed by bus  just as railway photographers used to do in regular steam days. If you want to travel on the train you can do that, but photographing it requires that you follow it on the charter bus. All in all, the technical condition of the railway and its equipment is not suitable for us to guarantee anything. 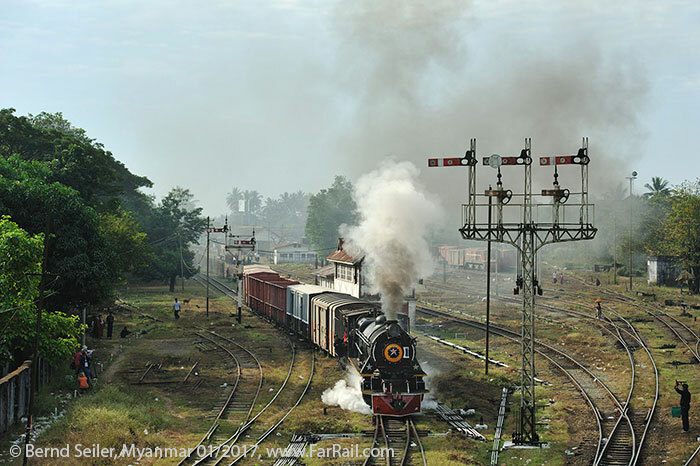 The steam locos of Myanma Railways haven’t been used for a long while and haven’t been fully overhauled. They’ve just been made serviceable again. It might be possible that some parts of the programme cannot be operated as planned and need to be skipped without replacement or compensation. 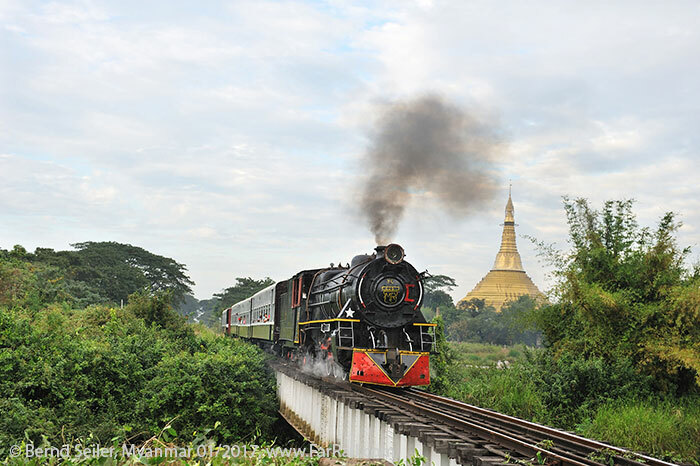 Paid money will not be refunded by any of the Burmese officials or railways, even if they can’t offer what we have paid for. I even had to sign a paper which stated this. However, we don’t expect serious difficulties in this matter. On all the recent tours the contractors in Burma tried very hard to fulfil all our wishes. Time keeping in Myanmar is nothing you should bank on. There might be hefty delays. However, our charter trains in the past have departed almost always exactly on time. Charter buses (mostly with air conditioning), local airplanes, trains and accommodation represent the standard of our host country, which may seriously deviate form European, Australian or North American expectations. While we will try to avoid long walks, some photo positions may require a bit of an extra effort. The first part of the itinerary is designed especially for photographers and video filmmakers. To make the most out of it, we may change our route or hotels/guesthouses without any notice in advance. This does not apply for the Golden Land tour where we’ll focus not only on photo spots, but also on a certain level of comfort and relaxation. Usually our hotels are good, but occasionally the standard of hotels in smaller places may be well below a Romanian youth hostel in the 1980ies! Please be prepared. After you have seen and felt the quality of the roads, you’ll understand why we don’t go long distances just to get to a better hotel. Please note that morning trains have a higher priority than a breakfast in the hotel. So breakfast will be served as a packed box if necessary. Lunch and dinner are planned according to the situation with the steam train timetable. If necessary we’ll buy some papayas, bananas and oranges instead of risking missing some good pictures because of a time-consuming restaurant stop. Sometimes, excellent lunches, with local fruit and rice and curries are usually available in the small stations along the railway too. Beverages are not included in the tour price. Please bear in mind that accommodation and transportation in Burma fall short of EU, Australian or North American safety standards. Always use common sense when crossing roads and railway tracks. For instance, if you can’t walk on dark streets in the night please take a strong torch with you. 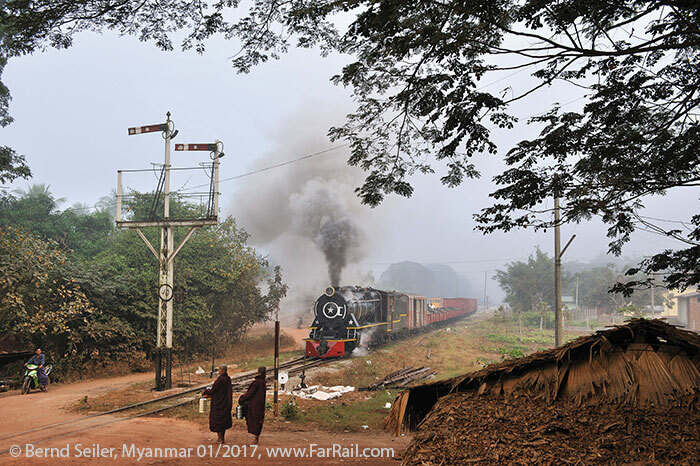 Neither the local operator, Myanma Railways, nor FarRail Tours can be held responsible and will not accept any liability whatsoever in the case of any accident, damage or bad effect due to delays etc. We suggest you take out a comprehensive overseas accident and health insurance policy. We recommend that you take some US dollars with you. To change some money at the airport for souvenirs or beverages, other currencies such as British Pounds are ok as well. With about $250 US you should easily be able to cover all expenses. Charging rechargeable batteries in the hotels is not a problem. Sometimes there’s a power cut, and the hotel’s generator set is not able to deliver the same voltage as the country’s network. Therefore recharging batteries can take a longer time than usual. However, no one missed a picture on the recent trips because of a battery problem. Tips, please expect some 15 US Dollars per day.